Echinacea, commonly known as purple coneflower, is an herbaceous perennial plant with four species and six varieties all indigenous to North America. This popular plant has been used in perennial gardens for over 200 years and is widely known. It has also been used historically in North America by indigenous people as a medicinal herb. It’s also used as wild edible food and provides nutrition in addition to many health benefits. 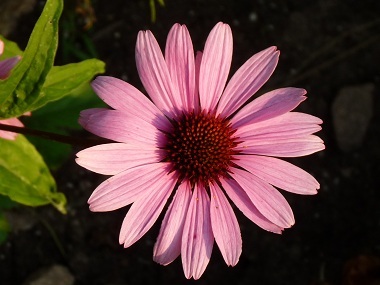 Echinacea comes from the Greek word "echinos" meaning hedgehog in reference to the spiny center cone. Distinguishing Features: This heat and drought resistance plant is very unique with its daisy-like purple/pink flowers that sport a prickly seed cone. The leaves are rough to the touch. Flowers: The flowers are rich purple to pink in colour and the florets grow round a high seed cone. This cone has sharp spines. 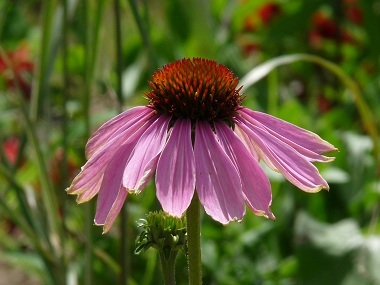 Echinacea blooms about mid-summer and lasts about a month, after which there is a temporary dormancy. Some plants may bloom again during early autumn. Fields of Nutrition has medicinal benefits and vitamin/mineral content of Echinacea. Leaves: The leaf shapes are generally narrow, lance-shaped (or ovate) and toothed. 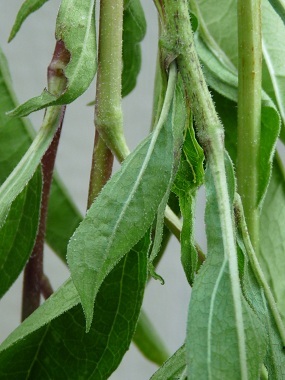 The upper surface of the leaves is often dark green and has sparse white hairs. 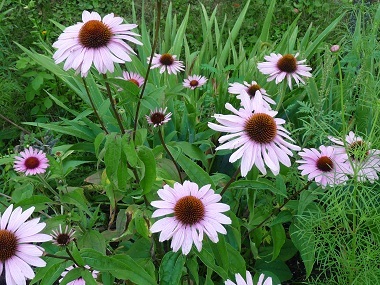 Height: Echinacea averages between 60 cm to 1 metre. Habitat: Dry open woods, barrens and prairies. Edible parts: Leaves and flower petals are edible. All parts of the plant have been used in tinctures or other medicinal methods.